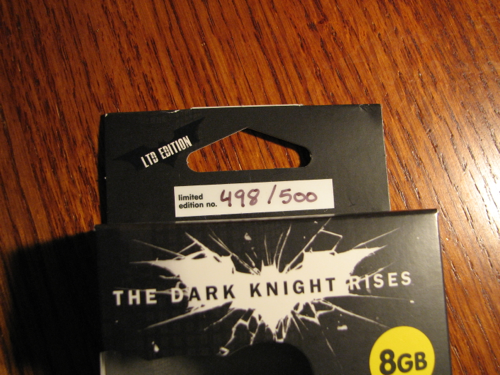 Nobody can argue the recent popularity and publicity surrounding Christopher Nolan’s final installment of the Batman trilogy, The Dark Knight Rises. While reviews about the film and its characters may be mixed, it’s hard to say that the merchandising of Batman-related products hasn’t been a success. 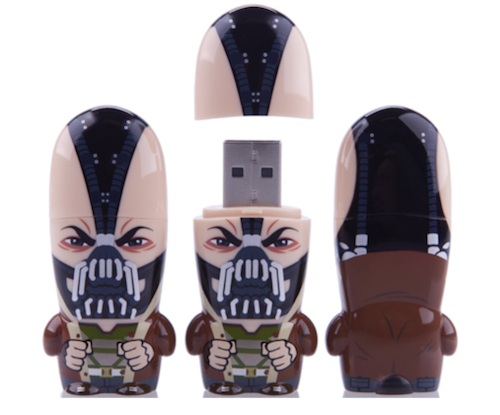 Mimoco has just added the characters of Batman and Bane from The Dark Knight Rises to its popular line of character-themed USB 2.0 flash memory drives. The Bane Mimobot was produced in a limited edition lot of 500 and was released at the 2012 San Diego Comic Con. Being a limited edition, it’s hard to say if the flash drive will increase in value over the years, but my guess is that it will. Mimoco sent MyMac.com an 8GB flash drive numbered 498 of 500 as an evaluation unit. 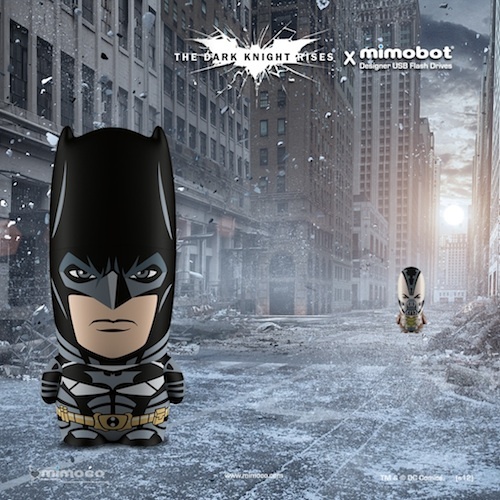 The Bane Mimobot is a USB 2.0 flash memory drive and comes pre-loaded with The Dark Knight Rises Mimobot-themed desktop wallpapers for your PC, Mac, iPad, iPhone, or iPod Touch. It also comes with a number of Batman icons and avatars for use on your desktop. They provide a cute touch to your daily workflow if you’re a fan of Batman movies. To access your Bane Mimobot’s memory and features, you merely pull off the top off his head to reveal the business end of a USB 2.0 connector. I’m sure Batman would have liked to pop the top off Bane’s head this easily in The Dark Knight Rises! Although $29.99 is a bit expensive for a 16GB flash drive, the Limited Edition Bane Mimobot is more for fans of the Batman franchise who don’t mind spending a few extra dollars for their favorite characters’ products. For die-hard fans, Mimoco also offers a 32GB drive for $39.99 and a 64GB drive for $69.99. If you’re a collector, this is surely something to take a look at. Releasing only 500 of these drives means they will be hard to come by in the near future.